I have to admit that I've never watched All My Children but I do know who Susan Lucci is. Don't know her character's story but I was looking forward to reading about this enduring actress' life. I found her Italian/Swedish/French-German background interesting as she recalls her very interested-in-his-family father, how she didn't really fit in (too ethnic) in her neighborhood (Long Island, NY), her Italian grandmother, and her red-haired mother. Lucci knew from a young age that she liked to act (play acting/directing/choreographing shows at home) and pursued it during and after college. Her story is rather like a Cinderella story in that she met and married the love of her life, landed the role of Erica Kane in the burgeoning soap opera, and thus began the life/career of the Susan Lucci we know today. Stable upbringing, no terrible scandals or drug or alcohol abusers, and no divorces helps make for a happy life. Presumably. 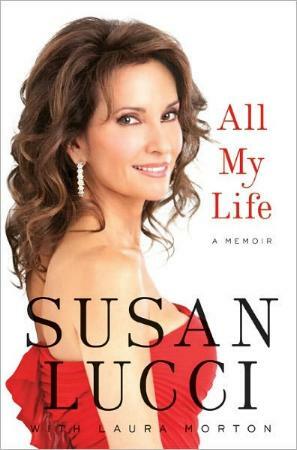 She gushes about her beautiful and wonderful two children and their accomplishments, but the book is predominantly a recap of her role as Erica Kane on All My Children as well as her other work, which includes a stint on Broadway, a five-year cabaret "tour" with Regis Philbin, a contestant on Dancing with the Stars, her involvement with Feed the Children, and her move from New York to Los Angeles. She also gushes on about her co-workers and crew ad infinitum. Too gushy. Conclusion - Nothing to write home about. Perhaps would appeal to die-hard AMC fans. In a word? Unremarkable.